It’s that time of year again when shops are starting to take away all the year long staple items on their shelves,and replacing them with glittery, twinkling and shiny temptations for Christmas. This year though, one of the hardest toys to find locally are the Tech Deck and Flick Trix finger trick skateboards and bikes. In case you have not come across these little gadgets, they are found in the hands of many a grubby 6 – 12 year old boy in our area. September and October brings a totally different perspective on these little toys from one year ago. Last Christmas, a generous Santa Clause brought a big box with some generic finger skateboards and a huge ramp to our house. This box was used for all of 10 minutes and relegated to the back of the toy cupboard. Fast forward six months and the ramp and boards were being pulled out of the cupboard and fought over by two of my minis’. The change was brought about by the onset of the new boy craze around town. The generic finger skateboards were not good enough though, and pester power started. If they are not the “real” Tech Decks, then seemingly no-one will talk to them. A birthday or two came and went and some “real” Tech Decks arrived in the house, courtesy of www.toysrus.co.uk, along with a couple of ramps by someone called Ryan Sheckler from www.amazon.co.uk. The two trickster skateboarders started to practice in earnest, and with miniature screwdrivers at the ready had boards with orange, white, black and yellow wheels, so that they would be good enough to swap at school. The old Top Gear card craze of early summer was well and truly over. I thought that I was safe, skateboards in place, ramps in place, different colour wheels in place, and lots of skateboard swapping going on in schools and playgrounds nearby. The peaceful life was not to be. September 2010 saw an interest in something that is a miniature BMX bike. Small comments began to be dropped about how fantastic they were. On the way out of school, many children were trying their hardest to get someone with a shiny new Flick Trix BMX bike to swap for their “best” Tech Deck. The smart children of the Flick Trix brigade held onto their prizes and slowly, very slowly, the pester power began again. With no birthdays between September and Christmas to be able to have one of these beauties for themselves, and being from a family that does not just buy everything that kiddies demand, I was struggling to find a way to end the misery of my children by not being with the “in crowd”. A flash of inspiration hit me and, and suddenly my boys had a new bedtime routine, with deadlines to achieve. Once they reached 10 nights of perfect behaviour in the evening going to bed, and keeping their rooms tidy – one of these bikes would be theirs. It took 15 nights for the deadline to be achieved and the day of reckoning finally came yesterday. After dropping boys off at school, off to www.tesco.com I go. Disaster struck as there were none of the £4.95 boards in stock, and they didn’t know when the next delivery would be in. Also on the shelves were two bike shop packs at three times the price. In these packs was a selection of different accessories to add to the BMX, and a box to hold all the small parts. There were only two of these beauties left on the shelf, and after wrestling with my conscience, I decided to buy them. On emerging from school, the first question that greeted me was a cry for the BMX with moving parts, working wheels and pedals, and I was really pleased to be able to say that I had one each for them. The look on their faces was priceless, as I had warned them that I might not actually manage to get my hands on them and that they might have to be ordered. Fast forward 28 hours and these bikes have not been out of their hands. I have been pestered and pestered and pestered again to help with changing over pedals, bike seat, wheels, grips, pegs and helping with nuts and bolts. The enjoyment out of this little toy is immense. When I first bought the skateboards, I baulked at the price of them, and of the ramps to go with them. On reflection over the last few months, I can honestly say that they have been excellent value for money. The amount of hours spent with these toys, fiddling with screwdrivers, concentrating, improving dexterity and the sheer benefits of the power of negotiation in the playground between children of all ages is astounding. The bikes may only have been in the house for 28 hours, but already the signs of being an enhanced version of the Tech Decks is emerging. 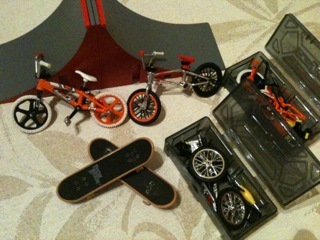 Both toys are on the table, the Tech Decks are still being used on the ramps along with the bikes. Both the Tech Decks and Flick Trix feel quite substantial for such little things and seem to take quite a bit of punishment. They are certainly breakable with quite a bit of force, but they do give the feeling of quality when you hold them. The bikes have taken their place in our household as staple favourites, along with the skateboards and the Xbox. What will come along between now and Christmas I have no idea, but there are rumblings of a special edition gold Flick Trix, and I am now scouring the internet trying to come across this elusive beast for Christmas day. Am I mad? Probably, but I have to admit, I have had many an enjoyable hour with my boys using these toys as they sometimes struggle with the tiny pieces, so it has been a “win win” situation and amoung our “best buys” of the year.